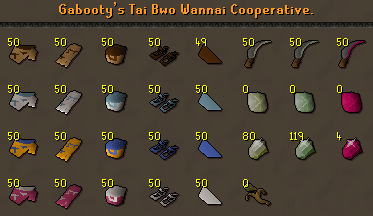 After completing the Jungle Potion Quest, you'll see that the villagers of Tai Bwo Wannai are just starting to move back in. After being away from their village for awhile, apparently the surrounding jungle has started growing in. Now they need your help to clean up! The begin the Activity, speak to Murcaily. He is located on the east side of Tai Bwo Wannai, and he will tell you about taking part in the Activity by helping to rebuild the village fence. Rionasta can send your items directly to your bank, at the cost of some Trading Sticks. Gabooty owns a shop just south of the Tribal Statue where you can trade your sticks for items. 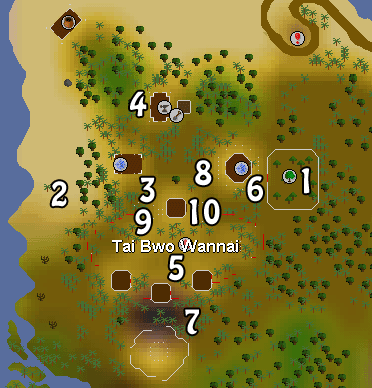 The Jungle Bushes can be found throughout Tai Bwo Wannai. With your Machete wielded, hack away at the bush! As you cut these, you will get sticks. As your chopping away at the patches of forest, you'll gain Favour Points. You can also gain them by repairing fences and killing the different monsters around the village. But of course, there are some monsters that will try and prevent you from doing this. Monsters randomly appear while you are cutting jungles, attacking you. You gain favour by killing them, and you can get special items. Info: Jungle Spiders are not very dangerous. They rarely poison and are easy to kill. Spider Carcasses can be used as food, if you have skewered it. To do so, use your Machete on any Spar's and you will get Skewer Sticks. Use one on the raw carcass, and cook it. You can also use arrow shafts, but you wont get them back after eating the spider, unlike Skewer Sticks. 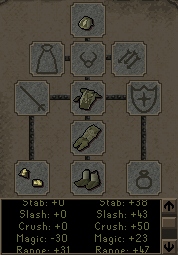 Snake Hides can be used to make the new Snake Ranged Armor. More information about this can be found later in the guide. Info: Tribesmen are stronger than Bush Snakes, and poison more often. Not really worth killing as they don't drop anything good. Info: There are 3 different types of Mosquitoes, ranging in levels. You get Agility experience for killing these. Info: There are 3 color types of these Broodoo Victims, each dropping a different color mask. They attack with magic; normal attacks won't affect them much, and they can weaken you. Each color corresponds to their weakness. If you use the correct item, you can heavily damage them instead of just hitting 1 or two! Yellow/Brown Broodoo's are weak against Relicym's Balm Potion. Green Broodoo's are weak against Antipoison Potions. White Broodoo's are weak against food. You can bring pineapples, slice them and use them on them. Also, you can get Broodoo Shields by using 2 Tanned Snake hides and 8 Nails near an anvil on a mask. Corresponding to its color, the shield has 10 Charges, which can prevent certain effects, such as poison, disease or damage. Sometimes, you will find a small gemrock in the jungles. They can be mined 3 times for 3 gems, after which you can sell to Gabooty. Rarely, a Gout Tuber plant will appear while helping the villagers. If you have a Spade, you can uproot it to get a Gout Tuber, which can be planted in a Farming Patch! To get Sticks, talk to the villagers and they will reward you. Say you've been helping around the village. Also, you can sell some gems to Gabooty for some easy sticks. Receiving sticks will reduce your favour %, but you can always raise it easily. If you wear a full jungle outfit (explained below), you will receive far more Trading Sticks for your favor! Also, after asking 3 villagers for sticks, your favour will decrease to 0% and you'll need to complete more tasks to build it up again. It's slightly less powerful than green Dragonhide armor, and it's heavier as well. It requires at least level 30 Defence and Ranging to be worn. You can obtain it by killing Bush Snakes and taking their hides while cutting the patches of Jungle. People buy and sell them for around 50-100 Sticks each hide. 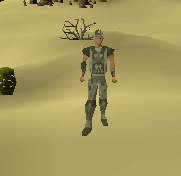 You must then tan the hides, which cost 15gp each. You need 46 hides in total to make a full set. just use a Thread and Needle to craft a piece.